Disaster for father as offspring is able to score before him. 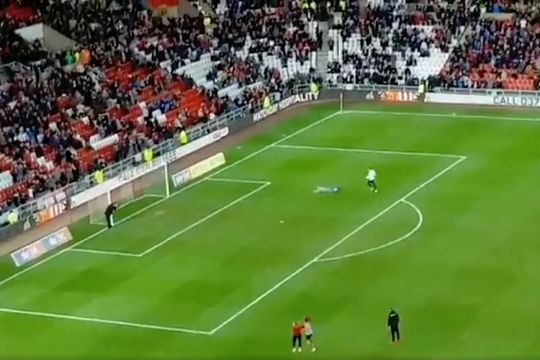 A father tripped over before he could shoot at the end of a race with his son at half-time of Sunderland’s clash with Luton on Saturday. The Stadium of Light consistently enjoys half-time races around the perimeter of the pitch before one participant has to score to win. At the break of a 1-1 draw with Luton in League One, a dad and his boy competed against one another as the crowd roared them home. With Dad a few paces ahead as the pair approached the empty goal, suddenly he falls and allows his son to take the ball and put it in the back of the net.